Today we remember the heart of the Blessed Virgin. In Luke we read of Simeon's prophecy - that her immaculate heart would be pierced so that the hearts of humanity could be opened. (Luke 2: 22-35). 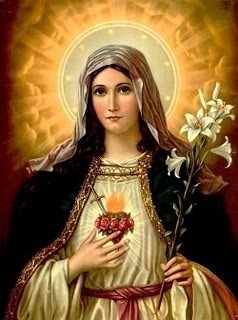 (Catholic) Images of the Immaculate Heart of Mary often show the heart/soul of Mary pierced by a sword- to show her pain and suffering. She is our mother and a mother who knows the deepest of human pains: the pain of seeing one we love suffering. Mary suffers with us. 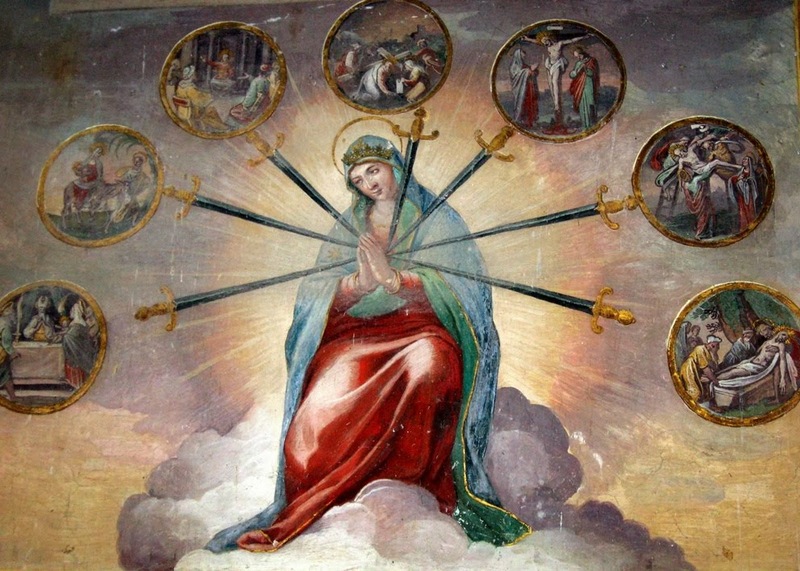 This image of Mary with a heart wounded by seven swords is also one we find in the Orthodox tradition - in icons of Mary of the Seven Sorrows or Mary - Softener of Evil Hearts (above left). Unlike the devotion to the Sacred Heart, the devotion to the Seven Sorrows of Mary++ is common to both the Catholic and Orthodox traditions. Such images remind us that the Blessed Virgin - the Theotokos - is our mother who understands and shares in our pain and sorrow. She stood at the foot of the cross and shared in his pain. She is with us as we carry our cross. 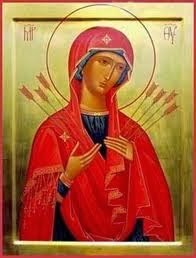 She was with Jesus as his heart was wounded. She is with us when our hearts are wounded. Holy Mary, Mother of God, Pray for us, now and at the our of our death. Soften our evil hearts, O Theotokos, and quench the attacks of those who hate us and loose all straitness of our soul. 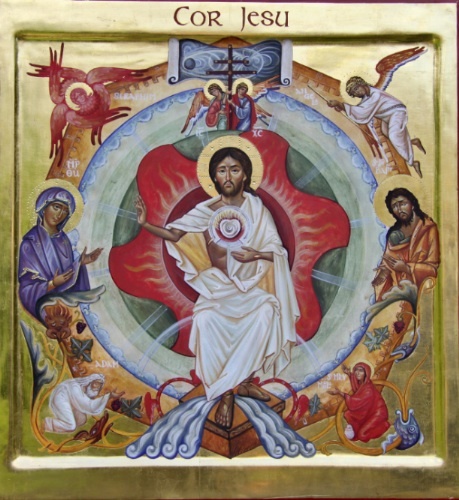 For looking on thy holy icon we are filled with compunction by thy suffering and loving-kindness for us and we kiss thy wounds; we are filled with horror for the darts with which we wound thee. Let us not, O Mother of Compassion, according to the cruelty of our hearts, perish from the cruelty of heart of those near us, For thou art in truth the Softener of Evil Hearts. ++ The Seven Sorrows of Mary. There are many devotional prayers which consist of meditations on her Seven Sorrows. See, for example Servite rosary, the Chaplet of the Seven Sorrows of Our Lady and the Seven Joys of Mary. 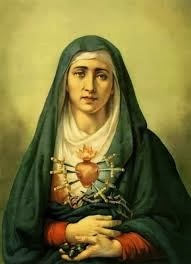 The "Sorrowful and Immaculate Heart of Mary" refers to the combined devotion of both the Immaculate Heart and the Seven Sorrows of Mary. Feast of St. Claude de la Colombière.